I’m a bit of a Twitter fan. Even I didn’t think I’d ever look at twitter for a weather report though. As those of us in the UK will know, there’s some pretty cold weather here at the moment with snow being predicted over the next few days. This afternoon I started seeing a few people I know from Seloc tweeting about snow where they were. After a while I started seeing people using a twitter hashtag of #uksnow. Great idea, by reading all the tweets with that hash I could read where it was snowing the most. 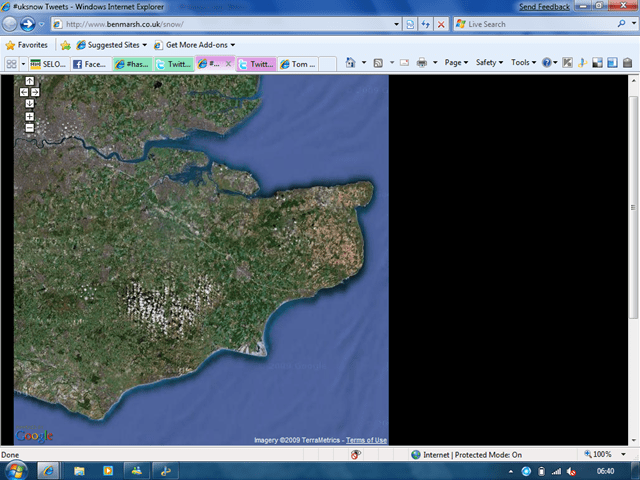 With the info being in a known format, some enterprising chap has mashed-up the tweets with google maps so you can now see where the snow is falling. All based on the real-time info posted on twitter. Its impressive stuff – especially seeing how it evolved over a few hours! A good example of how crowdsourcing can work for a common cause. If you can get the information into a known and structured data set it can be used in so many different ways. I’ve never met nor heard of Ben Marsh. Neither of us know who started the hashtag (I certainly don’t). But look what happened when it all came together… Just through the power of information. Hi Paul, thanks for the comment – it’s quite a story eh? It’s interesting to see how these things develop, with a miix of skills coming together through people that have never spoken let alone met. I’ll add a link to your blog on the post.